We work in textile business since 1951, operating in various fields: haute couture fabrics, wedding-dress fabrics, sportswear and lingerie clothing, underclothing and pyjamas clothing. 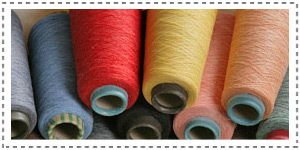 Moreover we propose every kind of yarns and fabrics, raw and colored, cotton-made and mixed ones. Nowadays in Puglia and in the Middle-South of Italywe represent qualified textile companies, Italian and foreign ones, with a service that exceeds the simple service. We establish with our clients a cooperation, a service and a consulting that holds in time. Our half Century of experience in our areas allow us to deeply know trends, requirements and habits of clients who can find in Dehò a valid and constant reference for consulting and purchases. We keep a wide attention to distribution and exclusivity of dealed products and we know the market at each level from direct import, passing by wholesale dealer, to specialized retailer. A relation so direct and outspoken with each member of the supply-chain, that allows us to deeply catch requirements of each client. and to do our best in satisfying them. abacus © 2007 | diego dehò Diego Deho' & C. s.a.s.